Minimalism put simply is the theory and practice of 'less is more'. "Minimalism is a tool that can assist you in finding freedom. Freedom from fear. Freedom from worry. Freedom from overwhelm. Freedom from guilt. Freedom from depression. Freedom from the trappings of the consumer culture we’ve built our lives around. Real freedom." It is more commonly heard of when referring to fashion, interior design, art or décor. It is important to note that minimalism, whilst currently very on trend, is not a new idea. And even more importantly is not unachievable to the average mum, messy teenager or busy workaholic. There is a perception that minimalism is unattainable or out-of-reach because of its uber-sleek and fashionable nature. But you don’t have to construct a very modern contemporary monstrosity with sand stone blocks as beds and chairs and one singular light bulb in order to achieve a minimalist home. The concept of minimalism has shaped the décor produced for it. Clean lines, neutral colours, feature textures and to some, a very uninteresting aesthetic, have been popularised because the idea of minimalism is to create a space that doesn’t distract you from the rest of your life. Similar to the KonMari method of “de-cluttering”, minimalism is about having things in your space and your life that really mean something to you. And ruthlessly cutting out the crap - so to speak. The problem in this day and age is that we’ve assigned meaning to a lot of clutter that isn’t adding anything significant to our lives. In all seriousness until you’ve de-cluttered you won’t be able to create a minimalist home. Once you’ve removed the majority of mess you can focus on a style and fashion that you like. De-cluttering can highlight the fact that you need a new vanity or bedside tables, or that your bed frame is out of date and you can essentially start from the bottom up, literally if you remove the bed frame entirely. You have wooden floors and you’re worried that your bed won’t stay put? You can get stoppers to hold the bed in place or maybe get an oversized rug; at that point you’ve started on a style. 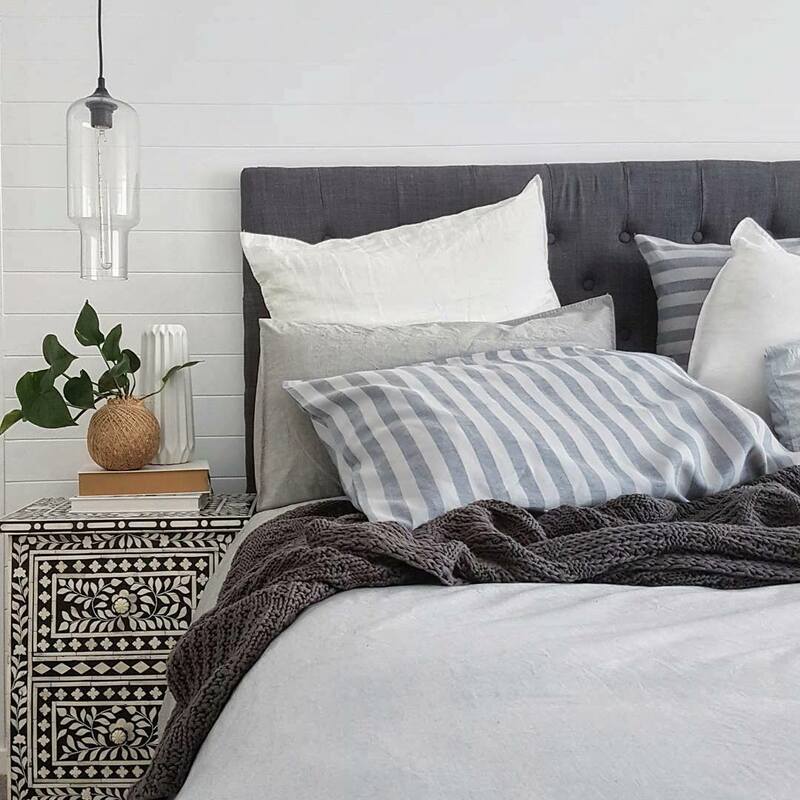 And you can build from it, if you have a heavily textured taupe and twine rug, go for a soft cotton quilt set and a textured blanket or throw, there is no need to go overboard. Remember, when a space has less in it a small effect can have a big statement. Minimalism as a style is neutral and simple and often very contemporary, though it can also be vintage and rustic looking. You don’t have to conform to any particular style to practice minimalism. Speaking from a purely trend specific perspective, minimalist interior décor has been keeping to light, airy and feminine themes with marble and copper as feature point accents. Currently minimalist style focuses on the textures and feel of objects and how they interact with each other. So instead of having a lot of things in one space you have one eye-grabbing thing that draws focus and highlights that area of the room. So the patterns, shine and earthiness of marble, coupled with either the frosted or gloss finish of the rich copper colour, presents contrasts that when used together or separately in the same space create balance. New colours and textures are being sought out for minimalist style, rich teals and smooth brass along with terracotta and brick (you could say the masculine version of light and airy is converting to deep and earthy). Small detailed accents are the easy first step into minimalism – but don’t overdo it and don’t have too many otherwise the entire point will be missed. Minimalist interior design is about having interesting pieces, and very few of them in a space. When selecting them aim for different colours and textures, ones that really draw your eye. There’s no right or wrong answer when picking out décor. How to become a minimalists at home? Starting in your bedroom for example, main points of clutter are: closet, drawers, under the bed, the bed, bed side table, desk, vanity and the floor. I can guarantee if you are reading this – you have too much stuff in your closet. And you’ve probably been trawling the internet looking for the golden article that will just sort out your closet for you. It’s annoying and usually the most time consuming part of the home to clear out, but once it’s done you won’t have to think about it for a while. There are methods upon ideas upon tips & tricks of how to approach the closet clean out, and guess what it always boils down to - being ruthless when keeping and chucking things. Having a donations box and committing to it – if you know you’ll be too busy to drop them off or you’ll just leave the box there until it gets chucked anyways, scrap the donations box. Keep pile and chuck pile. Once you’ve gotten rid of the stuff you don’t want or need, try and organize your closet. I know at this point I just want to shut the doors and not wear clothes for a week but it’ll be helpful and save you time later if you put in the extra hour or so now. The rest of your room will largely be clutter, let’s be honest. You store clothes in your closet, books in a book shelf and every other piece of furniture in your room has the singular purpose of holding other objects. It’s not uncommon to see a minimalist’s bedroom with the bed just on the floor and no bed frame – this takes away the possibility of things being stored under the bed. And by “stored’ I mean “swept, pushed, knocked away and out of sight”. You do not have to get rid of your big expensive and very pretty bed frame if you don’t want to – you do need to make a concentrated effort to not just kick things under the bed when you can’t be bothered clearing them up. A good thing to do is to pull out your suitcases and travel bags and put them inside of each other, then put those under your bed. They take up room and they need to be stored somewhere; if they’re under your bed then there is no room for any clutter under there. Bed side tables, shelves, desks and vanities really just need a quick clear out. Most of the stuff in them will be either rubbish, old and not used (therefore rubbish), brand new and never used (rubbish if you don’t use it within the week) or stuff you do use in difficult, hard to reach places, the wrong place or just completely missing in the layers of rubbish. OCD Fun Tip: Buy a bin just for this occasion, then throw that bin in a bigger bin. This is usually the point at which you realize you’re not a minimalist, you’re just Monica from friends. The key to on trend minimalist style? Foliage. Flora. Greenery. When you’ve gotten rid of the clutter on your floor and counter tops there is empty space. To avoid a stark living area and anything too hyper-modern, a pot plant or even vases with fresh flowers can soften, break up and balance out a uber-minimalist space. For instance, think of your linen cupboard. Do you honestly use every single sheet, pillowcase and quilt in it? Or have you got mismatched pieces, gifts never opened, and then the stuff used all the time? A big spring clean, once finished at least is very cathartic. Minimalism is just that cathartic feeling inserted as a constant in your life. Minimalism is the act of removing emotional attachment from objects. Like the satin pillowcase set that your mother gave you when you moved out (10 years ago), that never gets used, but you keep for pure sentimentality – chuck it, donate it, or give it away. Remember it and the feeling it gave you, but don’t let it take up space that could be used for something else.